Household Media Blasting – Clinton Township, MI. Household Media Blasting for all of your household items and projects. Household media blasting by Supreme Media Blasting is here to help you with all of your household projects that require paint and rust removal. Media blasting is a quick, powerful and efficient way to strip your household items and prepare them for a new finish. Not only can you save money refurbishing household items that you already have, but recycling is good for the environment too! You can also feel good knowing that media blasting is a relatively “Green” service as well. Much of our media is reclaimed, cleaned and reused. At Supreme Media Blasting we are looking to do our part in conserving the earth’s resources. After all, we are all in this together! 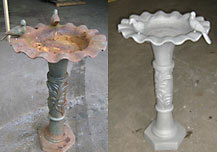 For some fun, non-media blasting related, repurposing ideas check out this HGTV article. What sort of items around my house are good candidates for media blasting? You might ask. The possibilities are endless. A few things that come to mind immediately are heat registers and radiators, outdoor furniture, railings, trailer hitches, bird baths, lawn ornaments, fireplace tools, grills, lawn tractors, scooters and bicycles. The truth is that if you have something that needs preparation for a new finish to be applied, the media blasting services at Supreme Media Blasting can probably take care of the hard part of the job for you. Give us a call now at 586-792-7705 and let us show you just how easy it can be done.